1910, Bavaria: When the car of honeymooners Gerald and Marianne Harcourt runs out of petrol deep in a forest, they seek shelter in a, nearby inn, where the only other guest is the sombre Professor Zimmer. Then an invitation arrives asking the young couple to have dinner in the local castle with the outwardly affable and hospitable Dr Ravna and his family. But, within the castle walls, all is not as it seems…..
Noel Willman and Jennifer Daniel crossed swords again in Hammer’s “The Reptile” (1966). Willman’s other appearance for them was in “The Vengeance of She” (1968). 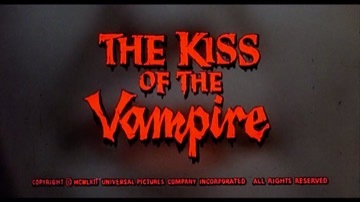 The climax of this film, in which a swarm of bats attacks the castle and the vampires, appears to have originally been intended for “The Brides of Dracula” (1960), but the burning windmill finale was substituted there for budgetary reasons.